The day of a highly contentious national election seems like the fitting time to talk about responding to stress in our environments. In truth, I probably should have put this together months ago (because the campaign has been all sorts of fun, right? ), and instead I’ll declare it a “better late than never.” It’s not like stress is going away from any of our lives anytime soon either, if we’re completely honest. If you think Facebook, Twitter, and listening to the news have all been stressing you out for the last few weeks, you’re completely right. Being around people who are stressed can stress us, even when it’s just observing that stress electronically. We’re perceiving threats and we go into fight or flight mode, even when the stakes don’t involve immediate survival. Change your mind– What I really mean here is to change your mindset. If something is bothering you, you either need to change it or change how you are viewing it. Complaining benefits no one, and if anything it scares people off because you get seen as being a “negative Ned.” Don’t be that guy. Create positive responses to stresses when they happen– Someone glaring in a meeting? Smile at them (no, really, do it! It’s fun!). Lead your conversations with others in a positive way (“How can I help you today?”) versus a negative opener (“I’m way too busy for this right now.”). What kind word or show of patience can you provide today? This is NOT hard, it does not cost money, and it makes you feel great. Try it! Build your copamine- You can handle these bad days. You CAN. The proof lies in the fact that you’ve survived all of the prior bad days. And if that reminder isn’t enough for you, why don’t you go for a walk/ run/ swim/ bike ride/ dogwalk/ yoga practice? Practice positive habits– It’s not just about these habits being “good” habits; they are habits that when built make you more positive. Want to know what they are? Here’s a TED talk to help you learn. Oh, and if you need a mediation resource, check out Headspace, and not just for Andy’s awesome accent. Feel free to use any of these tricks today for the election, tomorrow at work, or any time that you realize you want to be in a better space. Do not let the world get you down! This review of burnout in surgeons was published online in JAMASurgery last week, as was this Viewpoint on resilience and its relationship to burnout. 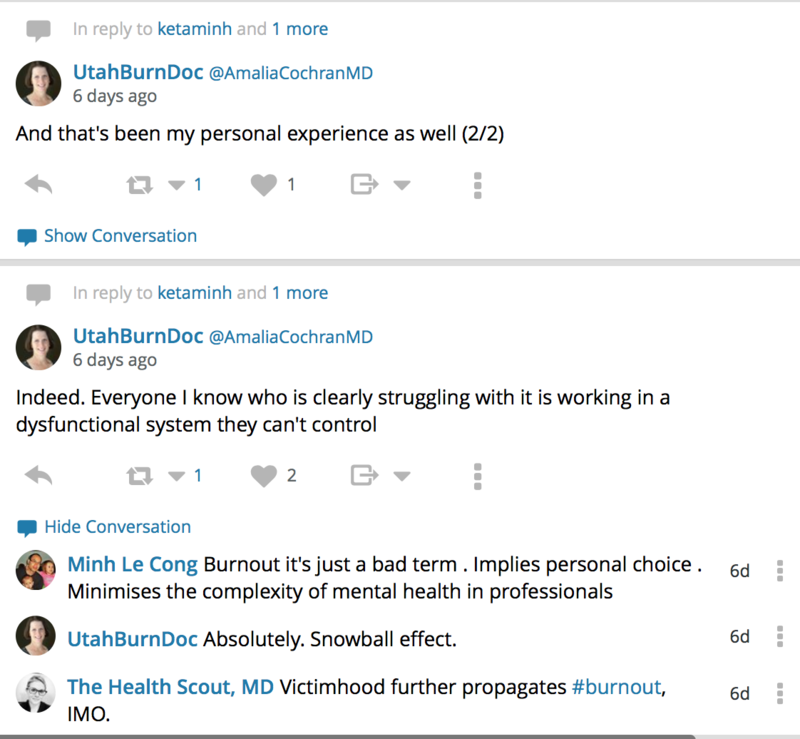 Of course, the root causes of burnout in medicine and surgery are protean. 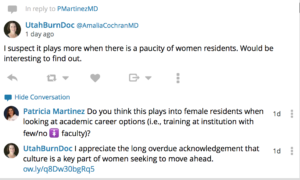 Specialty, gender, workhours, EMRs (yes, the EMR is being blamed now), basically anything that can contribute to job dissatisfaction regardless of profession are possible catalysts for burnout. I openly admit that I don’t spend much time discussing burnout. It’s not that I don’t care when my colleagues are suffering; I do care deeply about them and their distress. For me, it’s that discussions of burnout and “what’s wrong with surgery/ medicine today” tend to be problem focused. While people have generated all sorts of inquiry around risk factors for burnout and descriptions of its impact, resilience and recovery are woefully neglected. And yes, our systems should try to help mitigate controllable things that are clearly risks…but there’s so much more to the picture than the systems, and those other things get complicated. I’m also not saying I never have a sense of being burned out. There are weeks when I fear that I’m generally in over my head, when I’m exhausted, and when I feel like I have very little control over anything. Had you asked me to fill out a Maslach Burnout Inventory at 11 pm last Friday night, I’m reasonably certain that I would glared at you and ended up with a score very consistent with burnout. In contrast, had you asked me to complete one at 11 am on Saturday (after 6 hours of uninterrupted sleep on Friday night and an 8 mile run with my running “tribe”), it probably wouldn’t have looked nearly so dismal even though I was back in the trenches of patient care and was having a busy day. Here’s the thing: I could have skipped my Saturday run and slept more, and I’m certain some would say I should have done just that. However, physical activity that is a challenge is both grounding and restorative; thus my love of running and the basis for my nine half marathons in the last year. And while some days it really is about the running to process and running to manage on energy, Saturday was a day when it was running for connection. I knew that the best thing (again, for me) to get my head back where I wanted it, to feel like I had just a bit of control over my crazy life, and to enjoy simply being in the moment was to get up early and meet my running group. I’m going to tell you that your mileage may vary- your “thing” doesn’t have to be running. But what your “thing” does need to include is connection. Saturday morning I needed time with these friends- friends who cheerlead, who love unconditionally, who are incredibly funny, and none of whom are in medicine. I didn’t need for them to understand what my week had been like. I just needed to be with them for a while doing something that we all love. Brené Brown is right– we are all hard wired for connection. Find your tribe. Love them hard. Most importantly, spend all the time with them that you can. What if it really is that simple? All the cool kids are doing it? First, a brief apology for my unplanned “break” the last couple of weeks. Travel + a wicked cold (which was at least thoughtful enough to not settle in until AFTER my half marathon last weekend) + life = no blogging. Fortunately I have a backlog of topics so we’ll be good to go for a bit. Last week Medscape released their annual report on Physician Burnout. For those who don’t want to flip through the whole thing, the report indicates that burnout among physicians is at epidemic proportions. In one sentence, physicians are miserable. I have many friends who are in medicine, most of us in academic medicine but not all. There are times when our work nearly brings us to our knees; I had one of those call weeks two weeks ago that was both physically and emotionally draining. We share our tales of woe around EMRs and well-intended but poorly executed federal rules that actually impair the care of the patient (Meaningful Use, I’m looking at you). We talk about meeting requirements for MOC and how we’re a little intimidated by taking our recertification exam when we haven’t taken a night of general surgery call in several years. And yet…I don’t think that most of us can imagine doing anything else because at the end of the day we love what we get to do and we love the people we do it with and for. While there are times when any of us would definitely acknowledge being burnt out, I’m also seeing many of us exhibiting wisdom about knowing when we must have time and space to put on our own oxygen masks first. 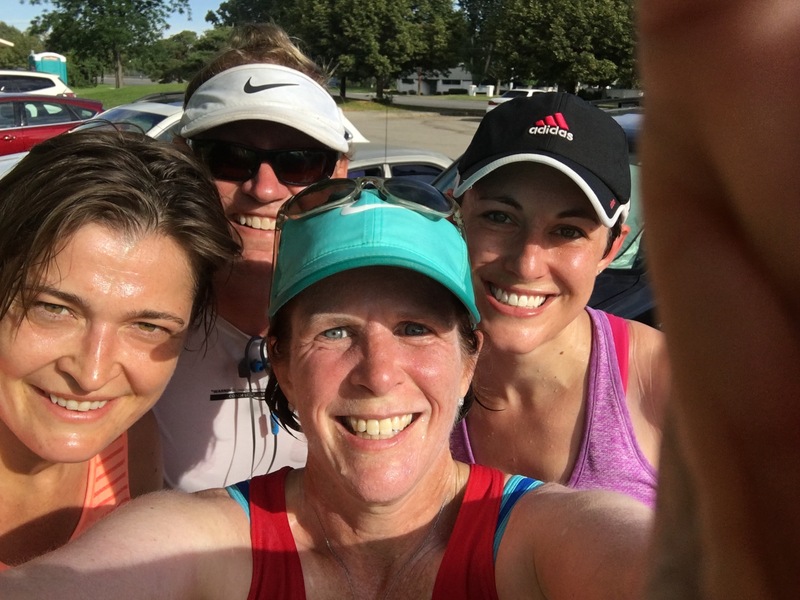 That’s why I had a crazy-hard week of call nights with tons of administrative stuff to manage during the days…then promptly got on a plane to Louisiana and spent the weekend with friends eating great food and running. Lest you think I am a paragon of self-care and burnout prevention, I’ll tell you I’m not. I’ve been tremendously burnt out at a few points in my career (twice during residency, once early in my attendinghood), and I hope that I’ve learned from my mistakes. I’ve learned that I don’t like who I turn into when I’m in that place (I become mean- and if you know me personally you know I don’t care for mean people AT ALL). I’ve also come to realize the simple joy in an early morning or late evening dog walk with Olivia; some days our adventures in the neighborhood provide the most effective therapy possible. I realize that time outdoors with a dog won’t help everyone in the same way it helps me, but I provide it as an example of a simple and high-yield intervention. We’re saying we’re burned out because we think we’re supposed to be burned out. We’re busy! We’re working hard! We’re supposed to be exhausted and maybe something is wrong if we’re not. 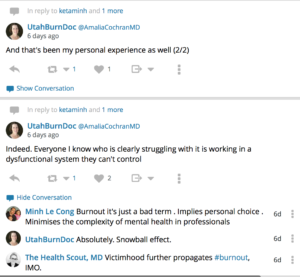 I suspect the truth lies somewhere in the spaces between these ideas; what I do know is that regardless of the actual incidence of burnout in medicine that a focus on wellness is both merited and deserved. The pace that our world runs at simply isn’t sustainable and the demands placed upon us by our patients, our teams, and the healthcare system are huge- much less the demands of our “normal person” lives. We both need and deserve time and space to do those things that heal and restore us if we’re to sustain our roles as effective healers, team members, friends and family, and humans. The challenge, of course, is prioritizing that time. The reality is that if you don’t prioritize if for yourself, no one else will do that for you. What’s your wellness today? What do you need to sustain you? Sitting still with a cup of coffee? Yoga? A snowball fight? I challenge you to pick something, then revel in that- even briefly. If you’re considering skipping tonight’s post because you’re afraid it’s going to be all about tree hugging and turning your heater down, please don’t. It’s not about those things at all (but they are important if you believe in climate change, which I do). I’m talking about YOUR energy and how we live our lives to manage that energy. While time is something that is finite and that you can’t simply “recharge” to get more, energy is instead a precious resource that varies for many reasons. Energy is what allows us to keep going, keep doing, keep being at our highest levels, sometimes in spite of those time limitations. Before you read on, I would like for you to stop and to consider what your energy level is right now while you are reading this. Has it been a long, chaotic day, and you’re feeling like a 2/10 who needs a nap or an early bedtime? Or are you coming off of an activity that completely charges your batteries- be it personal or professional- and you are a 10+ out of 10? And how many of you who were exhausted and drained acknowledged that to yourself while thinking, “And I have a billion things to do!”? Here is a truth: We are all busy. Here is another truth: We each have 24 hours in a day. The difference in what happens lies in the choices we make about their use. I’ve become much more conscious over the years of the things that help me recharge, and while I’m not always able to do them perfectly (that whole “doing the right thing for the patient” does come first), I certainly do them to the best of my abilities. I know that walks with Olivia make a huge difference for me, and our morning walk is an absolute- even if it only ends up being 10 minutes. I know that running is important to me and helps give me additional reserves to draw from. Yoga, same. I’ve also learned to commit one day a week to as little work as I can reasonably do- if on-service, patient care only, and if off-service, no work stuff at all- and I do take at least a few days a year off the grid where I may or may not be reachable. Since those times also typically involve being in nature somewhere, they are tremendously recharging for me. And the key question I find myself asking more and more is how something aligns with my priorities, if it’s a high-value activity. That answer can certainly vary depending upon context, but it also helps me to decide if I’m going to the opera at the end of a long day or coming home for a home-cooked dinner and some time with animals. While I love opera and value cultural activities, I will tell you that at the end of yesterday’s 12 hours of Burn Unit madness the best choice in that moment was home for dinner and a dog walk. It’s a value choice, I recognize, but both yesterday and today it served me well. In the Buddhist tradition, the last of the Six Words of Advice may well be the most important- “Relax, right now, and rest.” Sometimes our greatest work is to not do any work at all by simply being in the present moment. Empathy (and its manifestation in effective communication) has been described as an essential capacity of physicians, impacting doctor-patient communication, patient engagement in their care, and the effective care of patients as a whole. We know that empathy is essential to maintaining physician emotional and mental well-being, including avoidance of burn-out, depression, and suicide. And, of course, one of the things that we know is that empathy among medical students declines during the third year of medical school. In the traditional curriculum, that’s the year that students start to take care of patients almost all of the time, as opposed to the first two years in the classroom. 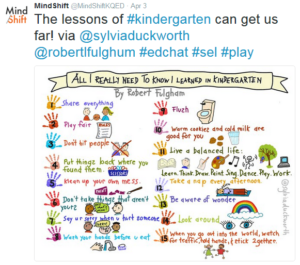 At the time when empathy is perhaps needed the most, both for the students and for their patients, is when they have an increasingly short supply of it. I was reminded again today that the benefits of empathy are too great for it not to be taken seriously by all of us. I am a big fan of Eric Barker’s Barking up the Wrong Tree blog and learn something routinely from his weekly emails that I receive. This morning’s blog/ email? 3 ways that empathy can improve your life. It was honestly too important and too relevant not to share, especially once three different Tweets were in my timeline this morning discussing aspects of clinical empathy. The real meat in his blogpost, and that I will not rehash entirely here, is that it is possible to “grow” your empathy muscles- and most of the ways in which this can be done aren’t that difficult or time consuming. The actions fall into three broad categories: Listen, meditate (especially loving-kindness, or Metta, meditation), and expose yourself to different ways of living. New experiences and different ways of living also improve creativity, meaning they also play a significant role in fostering progress and change. For the parents out there, if you want to foster empathy in your children, it appears you perhaps should give in to their pleas for a dog. Music lessons and unstructured play time (something that seems to be disappearing) also are important in development, so I am grateful my Mom provided all three of these. Now, go find a way to hang out with some different people and listen to them. It’s good for you. Okay, maybe that’s not exactly where I was going, but the levity is a perfect opener for tonight’s blog. We’re in the process of starting a wellness program for our residents, and last Wednesday I met with several of our residents one-on-one to help them establish wellness goals for themselves. 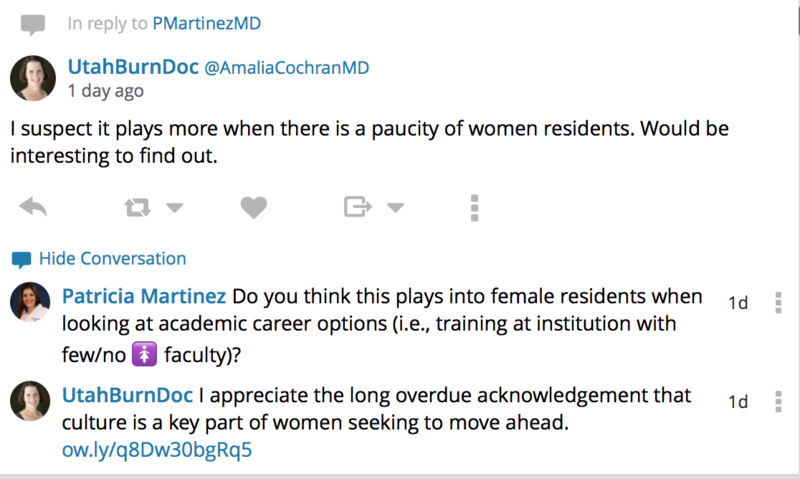 I’m not sure that I’m entirely qualified to do this, other than I do know what has failed dismally for me in this realm, and I’ve previously confessed to having experienced full-fledged burnout at least twice during residency and once as faculty. I suppose since I think I am getting it right more days than not, that makes me reasonably well qualified. And since my biggest vices are designer shoes/ clothes and half marathons, an argument could be made that I have mostly functional coping mechanisms. Confession: This has not happened without a LOT of work and a LOT of introspection. Time to just “be” with Olivia, Tucker, and Belle! Again, nothing that requires huge amounts of time, and all things that I know help keep my work choices and life choices at their best. What I’ve been most proud of in the context of these lists is how little they have shifted over the last three years (meal planning has come off of the weekly list, bless you creators of Blue Apron), and how grounding it is to go find my list when things are completely hectic. At core I’m not a list person- much more of a visualizer- but in these lists there is some inherent comfort and that gentle reminder to have a salad or to just shut things down and go to bed because it’s what will help me the most. And, of course, there are all of the things not on the list. I’m the first person to admit a love for social media, but FB, Twitter, and Instagram aren’t on the list for the true basics of self-care. Neither is Inbox Zero. And by virtue of their absence I’m reminded what my priorities would be when it’s incredibly easy to forget them. What are your bare necessities- your minimum requirements for self care? And how can you put them to work for you? 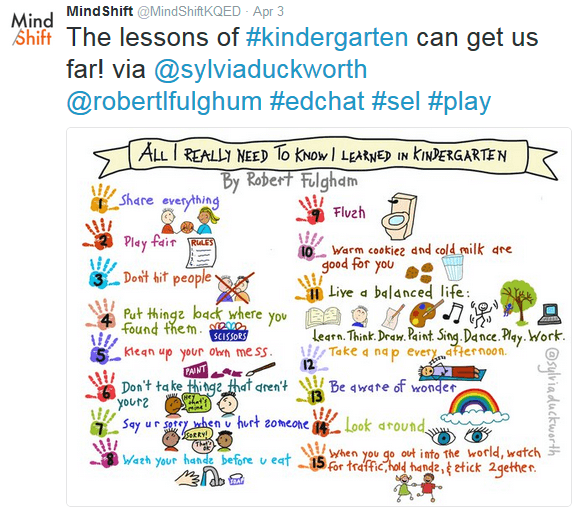 There’s your challenge as we move into Fall…I would love to know how it goes.